We need to spend about10 days this April somewhere nice within about 1 to 1 1/2 hour drive from O'Hare airport in Chicago. Any suggestions from you all ? Hey Vaughn, Me I would cross the line to Wisconsin, look there. Guess I will highjack Vaughn's thread... Anyone ever stay at North Fork Resort in Front Royal VA. Looking for a good overnight stop in that area and found online. Don't need anything nearby. 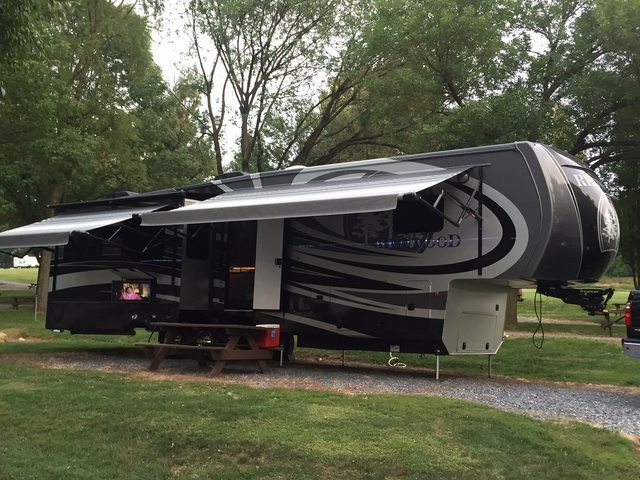 We stayed at the Endless Caverns RV in Front Royal, VA... I wonder if it changed its name? Anyway, if it is that one, it was about 10 minutes off of 81, nice clean, on the side of a mountain.. It's the thought that counts Joe!!! Left Baltimore today and heading west. 50-60 mph winds in western Maryland and West Virginia. Rig was rock steady but the first time I can remember having the accelerator floored and doing 50 mph. .......... in a dumpy little campground in Washington , PA south of Pittsburgh but as saying goes, any port in a storm. Headed to MorRyde tomorrow for an appointment on Friday to have the IS checked, bearings packed and change brake pads. How many miles have you put on your disk brakes before having to change the pads? Guy - I'll let you know tomorrow. Just got in to MorRyde and they will be doing service tomorrow. Last time we pulled wheels, the t ch made the comment that I would probably need pads the next time. None of the rotors show any scoring, but I'm going to have them changed tomorrow anyway as we are headed to the mountains. Right now, we've pulled over 30k miles with the discs and IS Suspension. How often does MORryde suggest you have the spring rubbers inspected/changed? Cost ?